Earn 135 SATVantage Rewards points with this purchase! 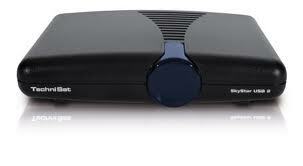 The SkyStar USB 2 is an external satellite receiver for PC and laptop. The compact box equipped with a USB-2.0 interface makes possible the reception of unencrypted television and radio programmes. The SkyStar USB 2 provides you with convenience and total TV and radio enjoyment. The box is equipped with a powerful and easily operated reception and playback tool (TechniSat DVB-Viewer), a first-class Electronic Program Guide benutzen (EPG) and numerous further attractive features. Using the PVR function it is child’s play to record TV and radio programmes and, for instance, by using the timeshift procedure, to play them back with a time delay. All-in-all the SkyStar USB 2 provides you with the functional range and convenience of a full-scale hard disk receiver. Thanks to the newly developed drivers the SkyStar USB 2 can also be used with Windows Vista – easy as pie!